In Normandy on the night of June 5/6, 1944, the U.S. 82nd Airborne Division overcame countless SNAFUs to take a key village. The night of June 5/6, 1944, was pretty much like every other night since the Germans had occupied Normandy and the Cotentin Peninsula in the summer of 1940: dark, quiet, chilly, and mostly boring. While there had been innumerable overflights by Allied aircraft (probably taking reconnaissance photos) and the occasional aerial bombing, Normandy was still considered good duty for anyone who had had his fill of war on the Eastern Front and was recovering from wounds psychological and physical. Here in Normandy there was plenty to eat and drink (especially Calvados, the strong brandy made from apples), scenery that hadn’t been mostly destroyed by heavy fighting, and French people who seemed to, if not exactly warmly welcome, at least be resigned to and tolerate the presence of foreign soldiers on their soil. When not on actual watch, looking for the first signs of an invasion that might or might not come to this location, the soldiers in Normandy had busied themselves by following Field Marshal Erwin Rommel’s orders to so strongly fortify the coast that the Allied invaders would not stand a chance, that they would, as Rommel had put it, be driven back into the sea. This night, with the peninsula cloaked in darkness, and the farmers and villagers fast asleep beneath the cloud-obscured moon and the German soldiers—who were on watch in their observation bunkers straining with the help of strong French coffee to keep their eyelids open and scan the black horizon or sound asleep in their barracks or making love to their French mistresses—had no idea what was about to hit them. A glance at a map of northwest France reveals a basic truth: there are no large cities in the arc between Cherbourg and Caen; only Carentan, Montebourg, Bayeux, and Valognes can be regarded as sizable. A spiderweb of roads connect one town and village and hamlet to another. One town at the center of a web of roads is Sainte-Mère-Église. But the roads—mostly narrow farm roads suitable for bringing produce to market or for driving herds of slow-moving cows from the barn to the fields and back again—also made it hard to move large formations of military vehicles and large numbers of troops. For centuries—ever since the Vikings or Normans first set foot here, giving the region its name of Normandie—the area has been pastoral and bucolic, with time measured by seasons rather than by the clock. The sturdy homes, shops, and churches are built solidly of stone—a whitish-grayish-yellowish limestone native to the region, capable of fending off the strong winds that blow in fiercely from the North Atlantic and sometimes rattle the shutters and windowpanes. Although treated to the same warm currents that can give southern England a semi-tropical feel (there are, after all, palm trees growing along the English Channel), the winds can sometimes be bitter, and the cold can penetrate through multiple layers of fabric like a gunshot. The people, too, like their buildings, are a sturdy lot. Hard-working like any agrarian populace, the dour Normans typically rise at (or before dawn), put in a full day’s worth of physical work, eat a hearty dinner topped off with a glass or two of Calvados, and retire at sunset. 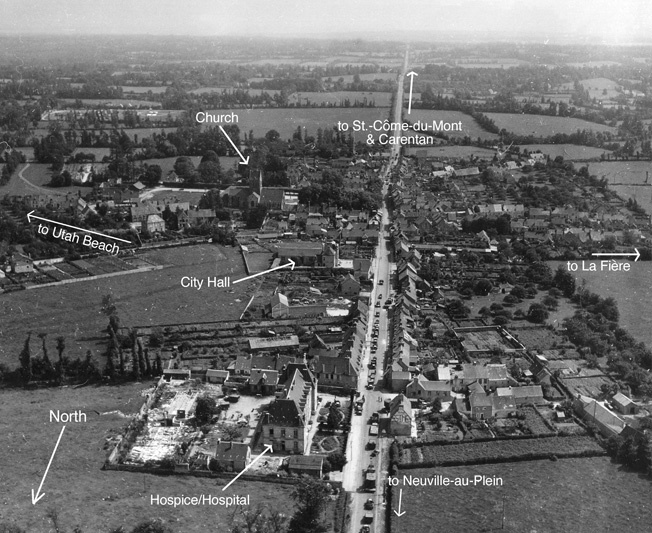 Aerial photo of Sainte-Mère-Église after its capture. Note American military vehicles lining the main street. The stolid citizens of Normandy were not happy, of course, when, in June 1940, the gray-uniformed Germans marched in and took over, but they accepted their fate the way they accepted most everything that came their way. For the most part, they did not go out of their way to welcome the occupiers, nor did they collaborate with them. They merely tolerated them and went about their usual business of growing the apples that went into the making of Calvados, pulling fish from the Channel, and pasturing their cows, extracting the milk to make into cheese. It was Sainte-Mère-Église, roughly halfway between Montebourg and Carantan, that had caught the eye of American military planners as early as 1942. Control Sainte-Mère-Église and you control the Cotentin, the planners saw. No fewer than five roads pass through it, plus it was only seven miles from the westernmost amphibious landing beach known as Utah. Drop an airborne division or two, along with their glider-infantry regiments, into the area and you stood a good chance of preventing German reinforcements from Cherbourg in the north and Brittany in the west from slamming into the troops coming ashore at Utah. The western end of the 60-mile-long beachhead that ran from La Madeleine to Ouistreham would thus be secure and the seaborne troops could move inland after overcoming local German opposition. Yes, Sainte-Mère-Église would definitely have to be taken in the early hours of D-Day. In the days before D-Day, Alexandre Renaud was a man with a dilemma. Besides his full-time job as the local pharmacist, the World War I veteran was also the mayor of Sainte-Mère-Église and, as such, he was expected by the occupiers to cooperate with them—and by his constituents to resist. Whenever the Germans gave him an order to do something, such as provide tools, transportation, and laborers to assist in the building of some defensive work, and he could find no one willing to perform the work, punishments would follow. In May 1944 the Germans were demanding all sorts of things. It was obvious that the local Germans were expecting an invasion and that Sainte-Mère-Église would likely be caught up in it. The roads through the town were filled with trucks towing artillery pieces and carrying troops in all directions. In the fields cordoned off by hedgerows, holes were being dug and large poles were being planted—Rommelspargel (Rommel’s Asparagus) some wag called them—designed to discourage glider landings. Trenches were being dug, and anti-aircraft guns emplaced. When Renaud spoke clandestinely with townspeople, everyone seemed to have an opinion: the Allies—if and when they attack—will cross at the Pas de Calais, Cherbourg, Le Havre, Dieppe, Boulogne, Dunquerque. Brittany will be the target. No, it will be the Cotentin. Ridiculous—the Allies will feint at Normandy but land on the Belgian coast. 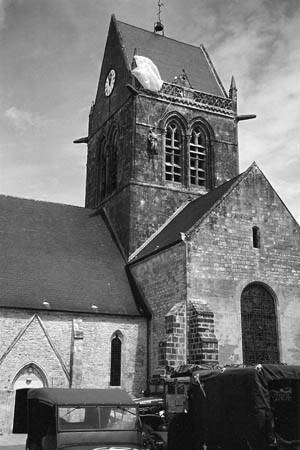 Few thought that Sainte-Mère-Église was in any real danger unless Allied bombers decided to target the anti-aircraft batteries that were being installed around the town. After all, air attacks had struck at the bridges at Beuzeville la Bastille and Les Moitiers en Bauptois. Someone else pointed out that leaflets were recently dropped over the area hinting at paratroop landings and showing illustrations of Allied tanks and jeeps and what British and American paratrooper uniforms looked like, and giving instructions on what to do in the event of an invasion. The Allies are probably dropping them all over France, someone else pointed out, just to keep the Germans guessing. 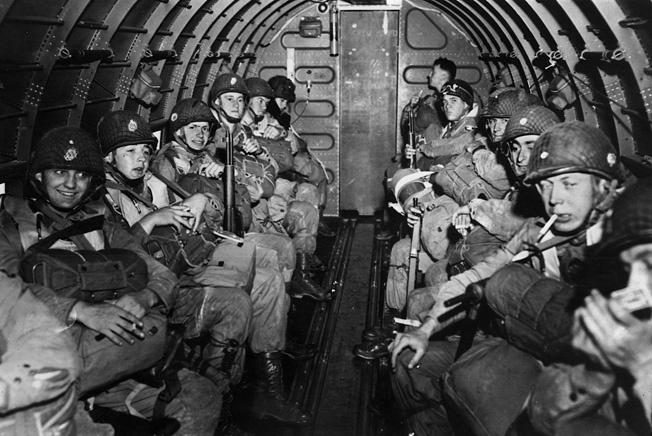 Their faces displaying a variety of emotions, these paratroopers from the 101st Airborne prepare to take off in a C-47 “Skytrain” on D-Day. Throughout May, the presence of German troops increased. Renaud said, “We have seen encamped in our fields infantry, artillerymen, Aryan Germans, and also Georgians and Mongols with Asiatic features … commanded by German officers. In the latter part of May, the artillery units quarter in Gambosville [less than a mile south of Sainte-Mère -Eglise]. The officers come to see me at the Town Hall. They need spades, picks and saws immediately. The town is to be secured, and the work has to be finished in five days. “I reply that there are no more spades or saws in the neighborhood and that they will have to canvass all the houses in order to find a few tools. They phone the Feldcommandantur at Saint Lô to get instructions about what punitive measures to take. He gives an evasive answer. Discouraged, they finally go to a hardware store where, after threatening to loot everything, they manage to obtain a few tools. Guns are then installed at all the town approaches; on the Carentan road, on the La Fière road, before Capdelaine, on the Ravenoville road. The invasion—Operation Overlord, with the airborne phase known as Neptune—had been delayed for a day because of a fierce storm that had swept over England, the English Channel, and the Normandy coast, but now it was back on. At RAF airfields with such quaint, typically English names as Upottery, Cottesmore, Down Ampney, Tarrant Rushton, Greenham Common, Barkston Heath, Brize Norton, and others, superbly trained British, American, and Canadian paratroopers and glider infantrymen waited for the orders to go. The U.S. 82nd and 101st and British 6th Airborne Divisions had been training for months in anticipation of just this moment. Despite some SHAEF staff officers’ worries that the American airborne and glider operations would meet with disaster, everything that could have been done to ensure success was done. The maps, aerial photos, and sand table models of each unit’s objectives had been carefully studied and memorized. Each plane had its precise schedule as to when it was to take off. All the necessary equipment had been gathered and issued. Knives and bayonets had been sharpened, faces blackened with burnt cork, last letters home written, last prayers said. The advance U.S. assault wave that would strike Normandy before the seaborne troops arrived numbered about 17,000 men being carried by 822 C-47 transport planes. They were the dice that American Generals Eisenhower and Bradley were willing to throw. Although the overwhelming majority of the sky soldiers had never been in combat before, and had only an inkling of what to expect once they reached France and the bullets began to fly, they were supremely confident of victory. 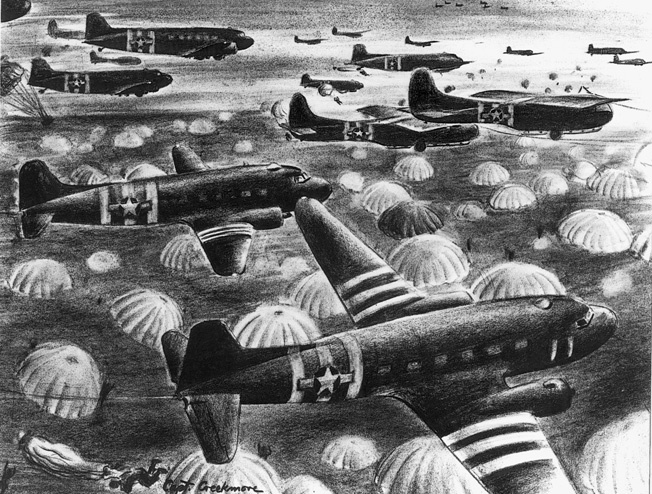 In a somewhat fanciful representation of D-Day, a combat artist shows Waco CG-4A gliders mixed in with the aerial invasion force. On the flightlines of a dozen British airfields, the C-47s began to roll, then took off into the dark sky and headed for France. The invasion was on, and no force of man or nature could turn it back now. Because of the German-imposed curfew, the town of Sainte-Mère-Église, like all the towns in Normandy, was dark and shuttered tightly on the night of June 5, 1944. Mayor Renaud was awakened shortly after midnight by the distant thumping of anti-aircraft batteries. As a precaution, he herded his wife and children into the family’s makeshift bomb shelter when there came a pounding on his door. Renaud opened it to find the town’s fire chief standing there in his shiny brass helmet, anxiously informing him that the two-story home belonging to the Hairon family, just off the southeast corner of the town square, was ablaze. The chief asked the mayor if he could get the commandant to lift the curfew. Renaud said he would try. He hurried to German headquarters at the town hall, explained the situation to the duty sergeant who, without waking the commandant, gave Renaud permission to call out the volunteer fire department and citizen bucket brigade to help extinguish the fire. German guards were also called out to stand watch over the volunteers and make sure no acts of sabotage were committed. Renaud then dashed to the parish house and asked Father Louis Roulland to have the sexton toll the bell as a means of alerting the citizenry. Soon more than a hundred men and women, some still in their nightclothes, had assembled outside the church to form a line of buckets from the pump at one end of the Place de l’Église to the firemen at the scene of the fire some 50 yards away. Some 30 well-armed German soldiers stood watch over them. While the British 6th Airborne Division was crossing the Channel toward its objectives at two bridges over the Orne River and Canal and the casemated guns at Merville on the far eastern flank of the 60-mile-long invasion area, the paratroopers of Matthew Ridgway’s 82nd Airborne Division—“Mission Boston”—were following the C-47s that were carrying Maxwell Taylor’s 101st Airborne troopers. The invasion route took the airborne armada to the western side of England, then south toward the Channel Islands, finally east across the Cotentin Peninsula. The C-47s were in formation and traveling at 130 mph; as they approached the drop zones, the pilots would reduce speed to about 110 mph or less. In a C-47 that was carrying 18 paratroopers from Company H, 508th PIR, 82nd Airborne, Lieutenant Victor Grabbe was leading his men in song, even though the tune and lyrics were swallowed up by the sound of the engines. Milkovics said, “I sat there thinking, ‘Boy, that Grabbe—he is one smart cookie.’ Under our kind of pressure, I doubt if any other stick leader thought to do this. I will never forget the intelligence and smart thinking of our lieutenant.” Unfortunately, Grabbe would die of wounds suffered in the upcoming battle. 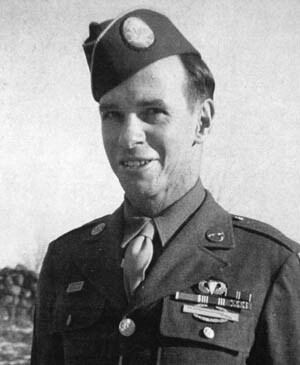 Sergeant Otis Sampson, E Company, 505th PIR, 82nd Airborne Division, was deadly with a mortar. At the controls of a C-47 loaded with 82nd Airborne troopers was 1st Lt. Bill Thompson. Despite the months of training, he recalled that many of the other pilots panicked when they flew into the clouds and when the ground fire began to reach up for them. Many broke formation, swerving wildly to avoid the ordnance, suddenly accelerating, or violently going into steep dives or sudden climbs. As the jump master in his plane, Lieutenant J. Phil Richardson, H/508/82nd, recalled, “When we arrived at the drop zone in France, I looked down at the DZ and saw it was covered with tracers. I felt that we should not land in that area and I told the pilot not to slow down but to keep going, which he did. Soon, the English Channel became visible on the other side of the peninsula. We had an order that no airborne troops could return to England [by plane] once they had left. The area that I looked at then was clear of tracers and we did the jump there; this was near the small city of Bayeux.” But Bayeux was over 30 miles from H Company’s drop zone. 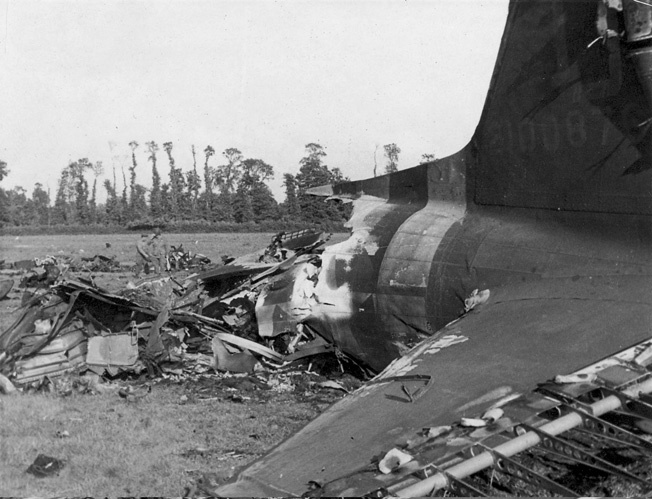 All that remained of a C-47 that crashed and burned in Normandy. Sergeant Spencer Wurst, F/505/82nd, wasn’t happy about the haphazard nature of the drop. The discipline acquired over many months of training with the C-47 crews seemed to have evaporated in the heat of the moment, as pilot after pilot broke formation in an effort to avoid the ground fire. Hopelessly lost, and under orders not to bring any paratroopers back to England with them, some pilots simply flipped the switch that turned on the green “jump” light—whether or not they were over their designated DZ. In his C-47, Dwayne Burns, F/508/82nd, was becoming more and more anxious as the moment to jump grew nearer. The red warning light by the door suddenly came on, meaning that they were just minutes away from being given the “go” signal. The jump master in Burns’s plane “was hanging out the door, trying to see how far we were from land, when our airship entered a cloud cover and the pilots started to spread out. Most pulled up and tried going over the top. It was going to be bad for jumpers because we would be widely dispersed at landing, but the aircrew needed to avoid possible collisions. No one wanted to be taken out of action that way. The fire at the Hairon house was not anywhere close to being contained. And then they heard it, the citizens and the soldiers. Above the church bells and the noise of the fire and the people fighting it came the sound of aircraft, at first far off to the west but quickly growing closer and louder until it was a wall of thunder beating the air directly overhead. People looked up and out of the blackness there came human forms floating down beneath mottled green parachutes! They were American paratroopers, and they had come to liberate a continent. All across Normandy in the early hours of D-Day, chaos reigned. Small groups and individual parachutists jumped into German positions and fought pitched battles with the enemy in the dark. Some troops landed in trees and dangled helplessly until they could either cut themselves down with their combat knives or were shot to death by the Germans. Others drowned in flooded fields, pulled underwater by their heavy equipment. Flaming transport planes crashed or exploded in midair. Farmhouses became fortresses, bridges barriers, and roadways killing zones. The enemy had no idea of the scope of the airborne assault and fought back furiously, aware that their—and Germany’s—very existence depended on defeating the Allied paratroopers who seemed to be behind every tree, building, and hedgerow. In some cases, Soviet POWs, who had been impressed into German service, fought as fiercely as their German overseers but, given the opportunity, were more likely than not to surrender at the first opportunity. German commanders sent frantic messages back to higher headquarters where the captains and majors and colonels had no better idea interpreting what was transpiring than did the average Ländser in his foxhole. Almost nowhere was the scene more chaotic than at Sainte-Mère-Église. Spencer Wurst, F/505/82nd, was one of those dropping over the town. “The first thing I remember seeing as I descended was a large spire in a bunch of buildings that later proved to be Sainte-Mère-Église,” he said. “To my surprise, there were fires in the town. Almost immediately after—these things happen in microseconds—I started receiving very heavy light flak and machine-gun fire from the ground. This was absolutely terrifying. The tracers looked as if they were going to take the top of my head off, but they were actually coming up at an angle. Many rounds tore through my chute only a few feet above my body. Another paratrooper, Pfc. Ernest Blanchard, was floating down over the town when a buddy next to him, loaded with a mine or demolitions, exploded and completely disintegrated right in front of him. 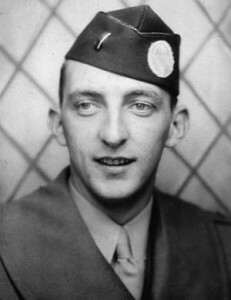 Lieutenant Vincent E. Wolf, 82nd Airborne Division, photographed in an English studio prior to D-Day. Earl McClung, E/506/101st, was jumping with a leg bag full of machine-gun and mortar rounds that weighed more than 60 pounds. “I couldn’t lift it,” he said. When he jumped, he noticed that he was coming down above a town where a major fire was burning; it was Sainte-Mère-Église, and he was many miles from his intended DZ. Most of the parachutists landed safely in the dark fields around Sainte-Mère-Église, but some of them—primarily from F Company, 505th—were coming down in the very center of the town, where the light from the burning Hairon house made it easy for the Germans to spot them. Breaking out of their momentary bewilderment, the German soldiers suddenly unshouldered their Mausers and Schmeisers and began firing up at the descending forms. The paratroops hit the ground or landed in trees or snagged their chutes on utility poles, killed in their harnesses even before they could reach their Thompson sub-machine guns or remove their disassembled rifles from their carrying cases and put them together. It was an unmitigated slaughter. The civilian bucket brigade scattered as the lead flew indiscriminately and a full-scale battle for the town square erupted. But neither the French nor the Germans immediately realized that the parachutists were Americans; most everyone thought they were British. As David Howarth noted in Dawn of D-Day, “The people of Sainte-Mère-Église, through all their years of listening to the BBC, had never dreamed that their liberators, in the end, would be Americans.” It was only after the American flags sewn onto the sleeves of the dead paratroopers’ jump jackets were seen that the truth became known. A dummy representing Private John Steele, F Company, 505th PIR, 82nd Airborne Division, still hangs from the steeple of the church in Sainte-Mère-Église. In actuality, Steele hung from the opposite side of the steeple. One paratrooper pulled his risers hard to slip away from the gunfire in the square but found himself drifting straight for the burning house. Having jumped from the plane so close to the ground, he had no time to maneuver and dropped into the inferno that was sucking in the air all around it; all the munitions he was carrying detonated. Another of the paratroopers, Private John Steele, a member of Wolf’s platoon, was shot in the foot as he descended, then got his canopy snagged on a corner of the church steeple and dangled there helplessly. With all the wild gunfire going on below him, Steele decided that the best thing he could do was play dead. A German soldier, Corporal Rudolph May, was up in the church’s bell tower when the airborne attack came. Noticing Steele dangling outside one of the openings in the steeple, May said, “There was a man hanging there, suspended. He hung there like he was dead—but after a while he started moving. Then we also heard him sighing.” May’s comrade raised his weapon as if to shoot him, but May stopped him. He decided to try and cut the suspension lines of Steele’s chute. After he had cut several, he threw Steele a rope by which he could lower himself to the ground and be taken prisoner. The exact number of paratroopers who came down in Sainte-Mère-Église is unknown, but Cornelius Ryan estimated it to be no more than 30, with about 20 of that number landing in and around the church square. Lieutenant Colonel Ed Krause patted the pocket of his jump jacket to make sure it was still there. “It” was the flag he had raised over the Naples city hall eight months earlier and he had sworn to repeat that act here in Sainte-Mère-Église—if he lived to do so. On the outskirts of town, Krause, from Green Bay, Wisconsin, and commander of 3rd Battalion, 505/82nd, surveyed the ville which, minutes before, had been in an uproar, what with a fire blazing, parachutists dropping here, there, and everywhere, and bullets flying. 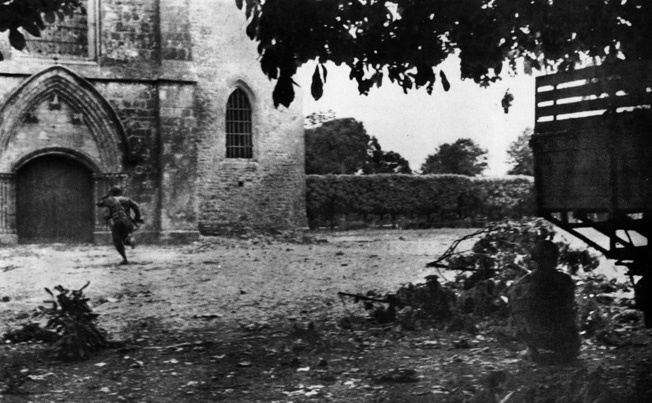 Troopers of the 505th PIR run for the door of the church in Sainte-Mère-Église as German artillery lands in the town on June 6, 1944. Krause had nearly 200 men with him, hiding in the weeds and in the hedgerows and behind buildings, preparing to enter the town. Without first making a house-to-house search, Krause and his men would slip into the town with their rifles empty, using only knives and grenades if they should encounter the enemy. That way, if any flashes were spotted in the dark, they would know it was the enemy doing the firing and be able to pinpoint the location. Krause knew that it was a dangerous gamble, but one he had to take. As he lay there, Wurst saw C-47s above him seemingly coming from all different directions and taking AA fire. He then saw a green star cluster. “This was the sign that someone in the battalion command group had reached the battalion assembly location.” With pain in his back and hips, he hobbled off in that direction and met up with his platoon leader, Lieutenant Joe Holcomb. 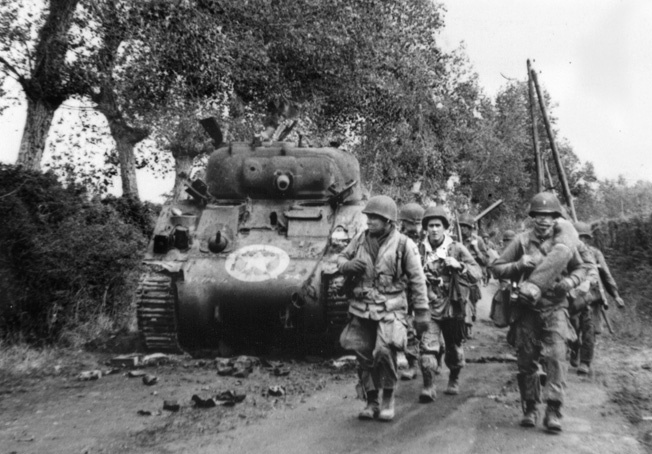 A unit of 82nd Airborne Division troopers advances past a knocked-out M4 Sherman tank along a hedgerow in Normandy. Vincent Wolf recalled that Vandervoort “had a broken ankle but he wouldn’t let that slow him down. He was the greatest guy alive—great, great, great, great. We always called him ‘Ben,’ never ‘colonel.’ He’d give you a rap on the head if you saluted him in combat. I was the same way; I told my men ‘Never salute me,’ because that gives away to the enemy who the officers are, and then you’d get picked off by snipers. That’s what we did with the Germans. Once you knocked their non-coms off, the privates, hell, they didn’t know what to do. We could improvise a lot quicker than they could. Vandervoort nabbed a couple of 101st men with a cart to haul him to his battalion’s objective. His mission was to get to Sainte-Mère-Église and that’s just what he intended to do, broken leg or not. As Lt. Col. Krause’s group crept closer to the town, it looked like everything was over; the fire was out, the townsfolk had returned to their homes, and the German soldiers had also vacated the square by the big church, apparently thinking the battle was over, not just beginning. Smoke still filled the air and the bodies of dead paratroopers hung from trees and poles or lay sprawled on the pavement. With stealth and silence the Americans slipped into town, found a building that was being used as a German barracks, and took 30 soldiers prisoner; 10 others were killed when they resisted. The Yanks also found the main communications cable to Cherbourg and destroyed it, then established a defense around the town’s perimeter. Although he didn’t immediately know where he was other than somewhere in northern France, Duke Boswell did his best to round up other troopers. “My mission was just to get our group together and move into Sainte-Mère-Église. I put a flashlight on top of a pole—several sections that fit together—about 20 feet high. I think the lens was colored—red or green. The idea was to stick it in the ground so the troops could see it as an assembly point. We found somebody right quick-like, and then we got several more together. I assembled most of my squad and we got a few more and then one of the officers got there. The officer took charge and we went into Sainte-Mère-Église. 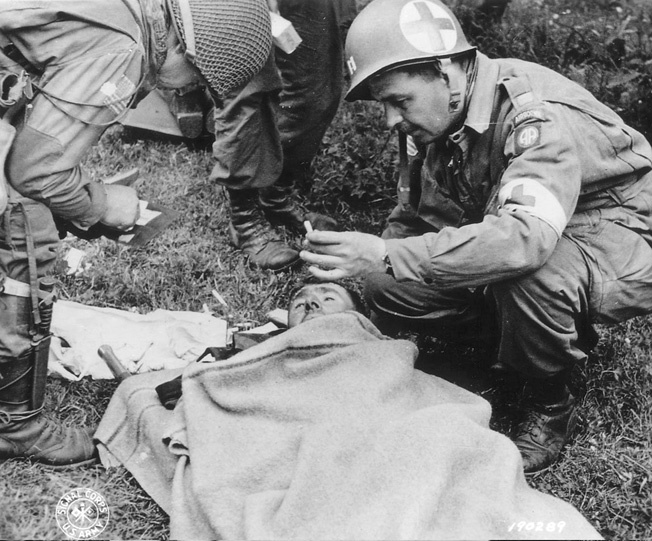 A captain in an 82nd Airborne Division medical unit (right) gives a cigarette to a wounded German soldier. To hamper the Germans from returning to Sainte-Mère-Église, Pfc. Leslie Cruise and other paratroopers had set out mines on one of the roads leading into the city, then dug foxholes and set up firing positions to establish a roadblock. After the first gliders began landing in the area, Cruise heard equipment being off-loaded, followed by the sound of an American jeep being started. The jeep, with two soldiers in it, came tearing up the road toward Cruise’s position. The paratroopers tried shouting to warn the jeep’s occupants of the roadblock and mines but the vehicle flew past them at a high rate of speed. Cruise said, “The occupants of the jeep were in a big hurry as we at the roadblock heard their running motor coming in our direction. Above all the noise, the distinct yells at the roadblock of ‘Hit the ground!’ were heard clearly and we all buried ourselves in the dirt of our foxholes. The driver must have thought our men were Germans and was not about to stop. Down the road they rode on full throttle. The defenders would indeed need the mines, for it wasn’t long before the Germans tried to retake the town. The sky finally lightened to a gray overcast. Ben Vandervoort decided that he had assembled all of 2nd Battalion that he was likely to gather and so, with about 400 men, including some from the 101st, moved out cross-country toward Sainte-Mère-Église, sending out small patrols to farmhouses and barns to make sure that no German troops were lying in wait. 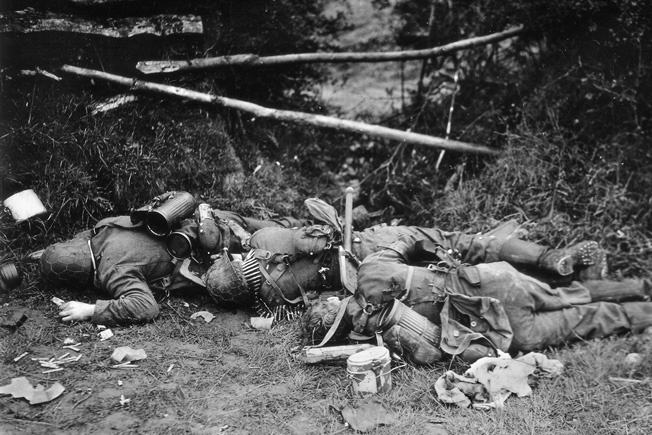 The bodies of three German soldiers killed in the fighting in Normandy. In the northern part of town, Krause’s American flag flew proudly from the city hall flagpole. Next door, at the large hospital/hospice, 505th surgeon Robert “Doc” Franco and his medics set up shop, caring for Americans, Germans, and civilians alike. “I was there from about 4 am until noon. During that time we treated about 30 or 40 casualties. Somebody came in and told me that about a mile away there was a farmhouse loaded with wounded guys. The family who lived there was doing the best they could to care for them. I walked to that farmhouse and, sure ‘nough, all around the outside there were dozens of wounded guys, some of them badly wounded. There were a few inside, too, in this large room. I was alone, with nobody to help me.” Franco himself would himself be wounded a few days later. But if the Germans thought the onslaught ended with the paratroopers, they couldn’t have been more wrong; the glider force was on the way. By the next day, June 7, Sainte-Mère-Église was still in 82nd Division hands, but no one knew how long the Yanks could hold if the Germans decided to counterattack in force. Vandervoort’s 2nd Battalion, 505th, was supposed to have moved up to Neuville-au-Plain to prevent the enemy from attacking from the north, but a German assault from the south compelled General Ridgway to order the bulk of 2nd Battalion to remain in Sainte-Mère-Église and reinforce Krause’s 3rd Battalion there. Vandervoort decided on his own, however, to send a reinforced platoon to Neuville-au-Plain to forestall any attack from that direction. General Gavin later called Vandervoort’s move “one of the best tactical decisions in the battle of Normandy,” for it was there that the Germans were gathering for a panzer-and-infantry assault. First Lieutenant Turner B. Turnbull III, a half-Cherokee, took 44 men up the N-13 highway from Sainte-Mère-Église to Neuville-au-Plain, pushed out the German defenders, then prepared for the counterattack. Vandervoort, in a jeep towing a 57mm gun, joined him. Receiving word from a civilian that a group of paratroopers were approaching from the north with a captured self-propelled gun and a large number of German POWs, Turnbull and his colonel watched and waited. Before long, the group was seen coming down the road. 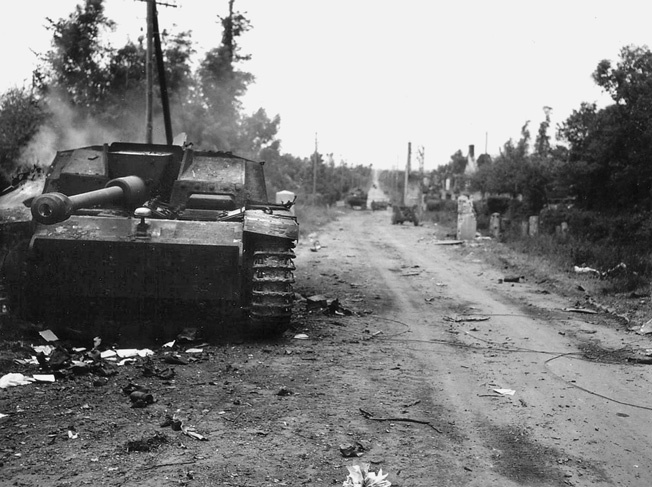 A destroyed German self-propelled gun smolders along the road leading from Neuville-au-Plain to Sainte-Mère-Église. Private John E. Atchley, H Company, 505th PIR, was credited with destroying the assault gun with a 57mm antitank gun—the first time he had ever fired one. His courageous stand caused the Germans to halt their armored counter-attack against Sainte-Mère-Église. It was a trick. The “POWs” turned out to be well-armed Germans, and the “paratroopers” were either Germans in American uniforms that had been stripped from the dead or were real Americans who had been captured by the Germans. At any rate, the SP gun, and more behind it, began blasting Turnbull’s positions in Neuville-au-Plain, along with mortars and small arms. Vandervoort told Turnbull to delay the enemy for as long as possible, then withdraw back to Sainte-Mère-Église; the colonel then departed to alert the troops in Sainte-Mère-Église that the enemy was coming. Turnbull never made it. Pfc. Stanley Kotlarz remembered a terrible shelling during the pull-back: “When [the shell] hit, all of us seemed to go up in the air. I got hit in the wrist and in the arm. A guy by the name of Brown got hit in the head. And Lieutenant Turnbull, it sheered the top of his head right off. When I got up, I saw Brown crawling away, staggering. Turnbull was lying there with his brains peeling out of his head.” For his valor, Turnbull received the Silver Star, posthumously. The 82nd retook Neuville-au-Plain the following day with the help of armor that had landed at Utah Beach. Turnbull’s delaying action had given the 505th time to consolidate its position and likely saved the men in Sainte-Mère-Église. Like the battles for scores of towns and villages in Normandy, the war passed through Sainte-Mère-Église, then moved on toward the east, leaving hundreds of dead and wounded—both combatants and civilians—in its wake. But the dead were, and are, remembered. 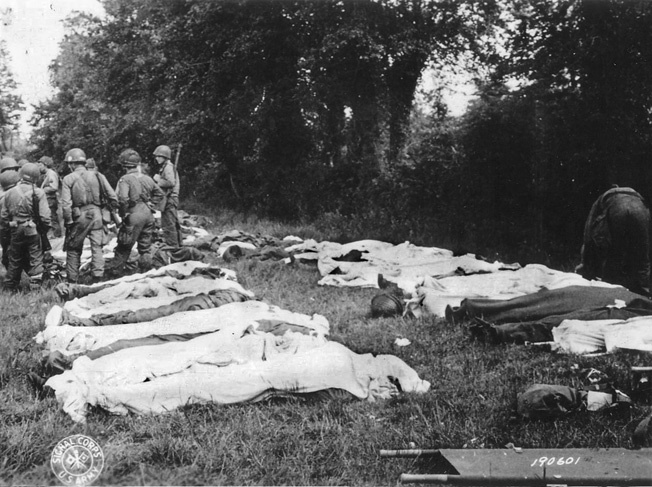 Dead American paratroopers gathered in a field by a Graves Registration unit prior to burial. This article is adapted from Flint Whitlock’s latest book, If Chaos Reigns: The Near-Disaster and Ultimate Triumph of Allied Airborne Forces on D-Day, June 6, 1944 (Casemate, 2011). Tags 101st Airborne Division, 82nd Airborne Division, Allies, Axis, Boulogne, Calais, Channel Islands, Cherbourg, Cornelius Ryan, D-Day, Eastern Front, English Channel, Erwin Rommel, European Theater, Fallschirmjäger, Matthew Ridgway, Maxwell Taylor, Normandy, Operation Overlord, POW, Royal Air Force, SHAEF, the Cotentin Peninsula.